, an English Jesuit and poet, was born in 1560, and is said to have descended from an ancient family, either in Norfolk or Suffolk. Being sent abroad for education, he became a Jesuit at Rome, Oct. 1578. In 1585, he was appointed prefect of studies in the English college there, and not long after was sent as a missionary into England. His chief residence was with Anne countess of Arundel, who died in the Tower of London. After carrying on his mission for some time, he was, in July 1592, apprehended and examined with the strictest rigour, but having evaded the questions put to him, was imprisoned for three years, and as he affirmed, underwent the torture several times. He owned that he was a priest and a Jesuit, that he came into England to preach the truths of the catholic religion, and was prepared to lay down his life for it. In Feb. 1595, he was tried at the bar of the King’s Bench, Westminster, and executed the next day at Tyburn. He was a man of singular parts, says Dodd, and happy in a peculiar talent of expressing himself in the English language, both in prose and verse. 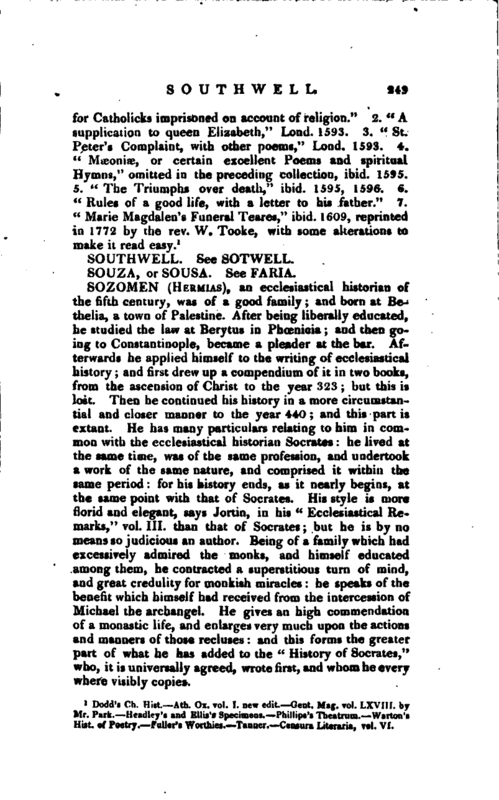 Edmund Bolton, whom Warton calls a sensible critic, speaks of Southwell’s works in the same strain of panegyric “Never must be forgotten St. Peter’s complaint, and those other serious poems said to be father Southwell’s: the English whereof, as it is most proper, so the sharpness and light of wit is very rare in them.” Mr. Headley seems first to have revived the memory of Southwell, as a poet, by some curious specimens, in which he has been followed by Mr. Ellis. 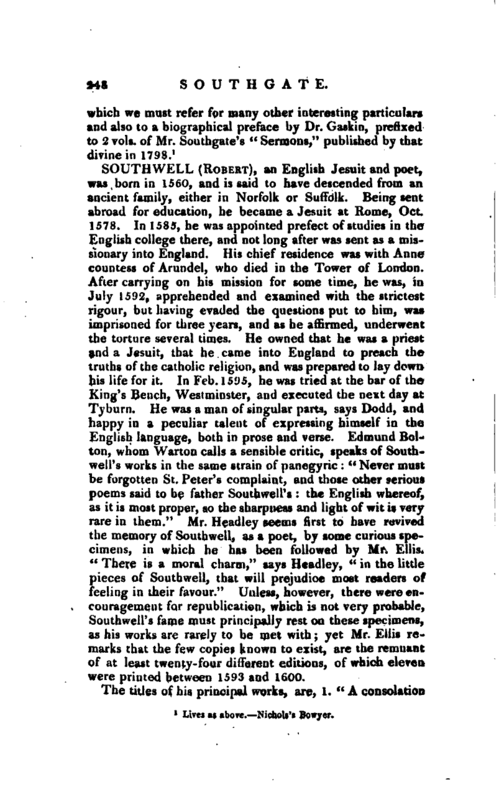 “There is a moral charm,” says Headley, “in the little pieces of Southwell, that will prejudice most readers of feeling in their favour.” Unless, however, there were encouragement for republication, which is not very probable, Southwell’s fame must principally rest on these specimens, as his works are rarely to be met with; yet Mr. Ellis remarks that the few copies known to exist, are the remnant of at least twenty-four different editions, of which eleven were printed between 1593 and 1600. Dodd’s Ch. Hist. —Ath. Ox. vol. T. new edit —Gent. Mag. vol. Lxvifi. by Mr. Park. Headl^y’s and Ellis’s Specimens. I’hillips’s Theatrum. Warton’s Hist, of Poetry. Fuller’s Worthies. Tanner. Censura Literaria, vol. VI.